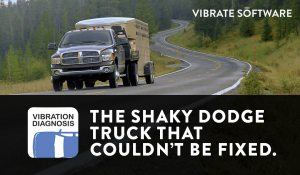 The Shaky Dodge Truck That Could Not Be Repaired - Vibrate Software, Inc.
Another memorable “can’t be fixed” vehicle was a full-sized 2500 series Dodge Truck. This vehicle had been sold new by a local dealership, it ended up having a vibration problem. The service department tried several things to fix the vibration but could not fix it. Under Utah’s vehicle “Lemon Law”, the dealership was about to have to buy vehicle back and then I received a phone call from a former student of mine asking for help. This former student is now a technician at the Dodge dealership in this story. They had also balanced the tires several times and had the driveshafts balanced; nothing would fix this vibration. The vehicle must be a Lemon, it can’t be fixed. Using the same diagnostic procedure outlined in our new NVH smartphone app, the technician and I performed a quick road test of the Dodge Truck. While driving out of the parking lot to perform the road test, I could feel the entire truck shaking up and down. I told the technician that there has to be a tire or wheel that is out of round. He told me that they had swapped tire and wheel assemblies with another Dodge truck without a vibration, but the vibration on this truck still persisted. This eliminated the tires and wheels as the source of the vibration. I said, great, you have eliminated a lot of work for us. We proceeded with the road test. As I suspected, the results of the road test indicated that the vehicle had a first order tire speed related vibration. As the NVH app’s own diagnostic help file indicates, first order tire speed related vibrations can be caused by several problems on the vehicle. While the technician and I were working our way down this list of items to check, we discovered that the left front wheel stud circle runout was well beyond specifications for that vehicle. The wheel studs are part of the hub and bearing assembly. Technicians at the Dodge dealership replaced the hub and bearing assembly with a new one, but it was worse than the original one. It took a third hub and bearing assembly to finally find one that was within specifications. Finally the vehicle vibration was fixed. There was a bad part on this vehicle. One very unhappy customer was the result. Hundreds of dollars were wasted on attempted repairs, many hours of labor were wasted because nobody really knew how to diagnose a vibration problem; they were just guessing! The NVH app eliminates the guesswork in vibration diagnosis and guides you step-by-step through the entire diagnostic and repair procedure.